Buying a gift for a friend or family member in medical school can sometimes feel a little challenging. Medical school takes up a lot of time and energy; if you don’t have personal experience in medicine, it can seem a bit like a black hole. However, the gift giving aspect really isn’t that complicated. Here we go over a detailed guide to help to give a fantastic gift to the future doctor in your life. By and large, I recommend that people give gifts that improve quality of life (day-to-day or experiences). Remember, you’re buying a gift for someone that is very low on time AND money. So, there are opportunities to make their everyday life better in many ways. If you are looking for something medically-related, we have ideas for that too. I have split the ideas up into a few different categories: practical gifts, practical medically-related gifts, and funny/gag gifts. Enjoy taking a look at these ideas of gifts for medical students! Most students draft coffee. Lots of coffee. I would recommend the following few items to make their coffee drinking experience better (and cheaper, if they frequent coffee shops). Most of these coffee accessories are inexpensive and will be used every day. There are a plethora of home coffee makers these days. You have single-serve coffee makers like Keurig. You have traditional drip coffee machines. My advice would be to get one that combines both. 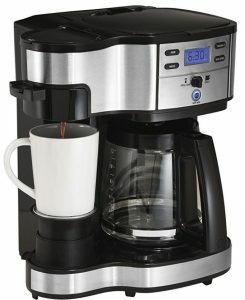 I recommend this model by Hamilton Beach because it allows for making single cups of coffee or a pot of coffee. It’s also less expensive than most Keurig models. Importantly, it also allows you set up your brew the night before. This is SO CRUCIAL for medical students – I have used a programmed coffee maker every day of medical school. It makes getting up at 4 for a surgery rotation that much easier. If you know that he or she already has a good coffee maker, you can get a cool, inexpensive alternative: a stove-top espresso maker or a french press. This is a little fancier. If you know that the person you are getting the gift for has a simple taste in coffee (like, folgers every day), then you can skip this idea. HOWEVER, I really recommend that coffee drinkers try out grinding their own coffee beans. Your beans will stay fresh longer and it really makes a difference in how your daily joe will taste. You can get a simple electornic blade grinder like this model from KitchenAid. That said, I would also recommend getting a conical burr grinder. In short, the difference is that these grinders make a very consistently sized grind, which improves taste. This is what the coffee shops use (obviously in much larger forms). You can get a manual burr grinder from JavaPresse if you want to save some money, which is probably fine if you’re buying this for someone who lives alone. 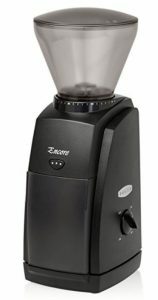 Or you can get an entry-level electronic version like the Baratza Encore (this is what I use!). This is a really cool, unique gift for medical students. I got one of these as a gift and I use it every day. Students today are much more ecofriendly than in the past. Reusable water bottles and travel mugs are the norm. I used my water bottle and coffee mug every day of medical school. Lecture, wards, clinic. Today, there are some incredible bottles that keep your liquid the same temperature for long periods of time. There are a few brands. I personally have a Hydroflask. If I put ice in it, the ice will still not be completely melted 24 hours later. It’s pretty incredible. There are both water bottle and travel coffee mug versions. I also really like glass water bottles like this – they are very eco-friendly! Although water bottles are maybe a little less exciting, they are great gifts for medical students because they will be used every day. It seems like 90% of medical students love their television. TV shows and movies today are best found on services like HBO, Amazon Prime and Netflix. The awesome thing is that you can gift a year’s subscription to any of these services. I personally think that HBO has the best content, but Amazon Prime is great pick because it also includes free 2-day shipping and other perks. Giving one of these sources of entertainment is one of the sure-fire hit gifts for medical students. If you don’t want to indulge the student you are giving to, then try a more experiential gift. Buy them gift cards to help make a trip easier. I recommend grabbing a Southwest Airlines and/or Airbnb gift card to help make a trip more manageable. You can even research a travel destination and provide research to add even more personal touch. These are very easy crowd-pleasing gifts for medical students! Sleep is paramount to success in medical school. These aren’t the most glamourous gifts you can buy, but they are super helpful to sleeping well. A good pillow is incredible. There are a wide range of awesome pillows. I personally love memory foam. I think Tempur-pedic makes the best of the ones I have tried, but there are plenty of less expensive options out there. If the person you are getting this for is anything like me, then they’ve used the same pillow for years, and would be thankful to get a nice new one! Sound is also a big part of good sleep. I go to medical school in a city. In a house near the hospital (read: sirens and helicopters). The house is about 100 years old, and I’m pretty sure the windows and doors haven’t been replaced in decades. What does that mean? Noise pollution. Many students are probably in similar situations. They probably also live with roommates that are on different schedules than they are. Getting woken up by noise is no fun. I am a huge fan of white noise during sleep, and the Marpac Dohm is by far the best. There are less expensive sound machines that include nature sound recordings along with white noise (also a recording, rather than made mechanically like the Marpac does), but these recordings can sometimes be lower quality and have strange repetitive chirps or beeps in the recordings. I would recommend this one if you want to save a little money. This may sound strange but weighted blankets work wonders. Most medical students deal with fairly regular stress and anxiety due to the demanding schooling and work load. This can carry over into insomnia. Weighted blankets are very helpful in reducing anxiety at bedtime and help people fall asleep faster (and stay asleep). These are a little more expensive, but are a very unique and helpful gift for medical students. You will probably want one for yourself, too. Try to buy one that is around 10% of the person’s body weight (i.e., a 15 lb blanket for a 150 lb person). I mean, shouldn’t a medical student be studying all the time? Not really. But if you want to give a more practical gift, then there are some really helpful tools that made my studying much more efficient. These are also great things to have for work at your desk. 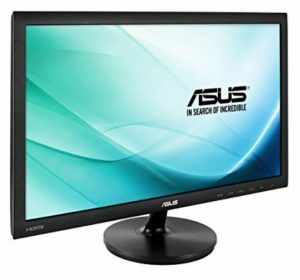 Getting a second computer monitor to link to your laptop or desktop is very useful for studying during medical school, or doing any other type of work that involves a computer. I found myself doing things like: watching lectures on one screen and taking notes on another page, or doing practice questions on one page and taking notes or referencing a book like First Aid for Step 1 on the other. The good thing is that monitors have become very reasonably priced. I would recommend getting a monitor between 19 and 24 inches. Being cost-conscious I personally like the Asus, HP, and Acer models. Ok. This might sound weird, but a good desk chair is an amazing resource. Most students, like me, are used to a low-quality desk chair that they were given by their aunt or that they found for free on craigslist. There are days where I am working 12+ hours at my desk. Having a nice chair makes it much more manageable. There’s a reason why there are desk chairs that cost in the thousands of dollars. They save your back and keep you from getting fatigued. A solid investment in a chair is well worth it, and thus makes a great gift for medical students. You get what you pay for with desk chairs, and since a nice chair will last a lifetime, it makes a tremendous gift. 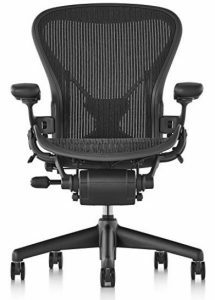 I would recommend the Herman Miller Aeron (note: (size B for people 5’5″ – 6’2″ and 150-220 lbs; size A for people smaller than that and size C for people larger than that), Herman Miller Embody, or the Steelcase Leap. I think that skimping here is not the best idea (these chairs are often less comfortable to begin with, wear out, or break) but if you want to get a relatively inexpensive chair (or perfer the “executive chair” look) take a look at: the Alera Elusion or the Ikea Markus. Many times studying during medical school requires referencing a larger textbook. I think these books stands are an awesome investment to help be more efficient as you move between a reference text and notes, powerpoints, or practice questions. They are certainly one of the more unique and helpful gifts for medical students. When you’re in the library or on the wards for long stretches of time, your phone battery often cannot keep up. While sometimes it’s possible to charge your phone (if you remember your charging cable), I found it’s more convenient to have an attached battery pack that doubles as a case. There are a number of good options for many smartphone models. These are good cases for the various versions of the iPhone: for the iPhone 6/6s, for the iPhone 8/7/6/6s and for the iPhone X.
I tend to think that some of the medically-related gifts for medical students are a little more difficult since some people have personal preference on what they use. That said, there are a couple options that I think any medical student would be happy with, since the vast majority of them use them. Check out the white coat clipboard and Littmann Cardiology IV stethoscope. When you’re in the hospital on rotations as a third year medical student, there’s a good amount of writing to do: patient histories, lab test results, phone numbers, etc. But you also need to have your hands free. 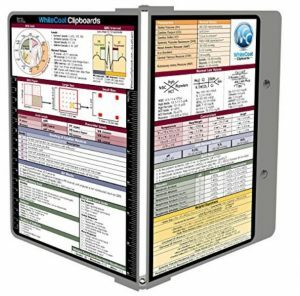 This clipboard is really handy: it folds in half so you can slip it into you white coat when you’re not using it. It also has some helpful information printed on it for reference. Most students use this on the wards, so it’s a fantastic gift for medical students. The stethoscope is one of symbols of a physician, and hence, a medical student. These are nice gifts that will be used often. The Littmann Cardiology IV is our all-around recommendation. We also have a write-up that goes more in-depth about about buying stethoscopes. You can’t go wrong buying a stethoscope; it’s a great gift for medical students. There are some really funny gifts I have received or stumbled across over the years. Something that makes a medical student laugh is always a great gift. 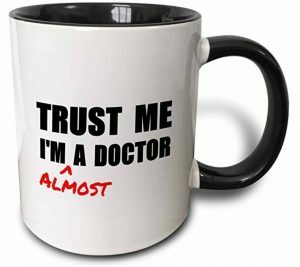 I personally think the “Trust me, I’m (almost) a doctor” gifts are hilarious: you can get a mug, t-shirt, and similar items. I also really like the GIANTmicrobes and I Heart Guts plush toys. If you know your loved one is really into infectious disease, you can grab them a MRSA stuffed microbe. OB/GYN? A smiling uterus. Cardiology? A heart. If you know what they’re going into, or interested in, they have made whatever cell/organ/microbe you can imagine. These toys are fun and always one of the go-to gifts for medical students.